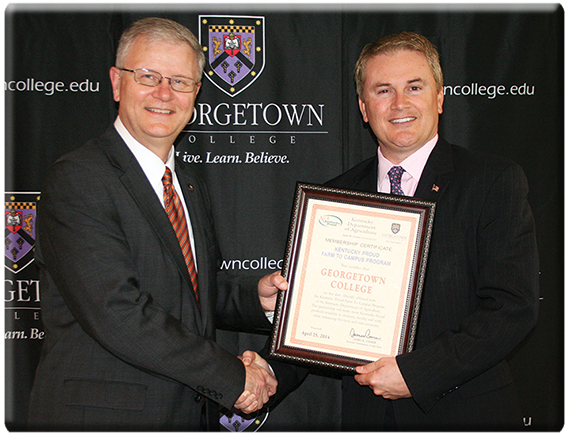 GEORGETOWN, Ky. — Georgetown College became the seventh higher education institution in Kentucky to join the Kentucky Department of Agriculture’s Farm to Campus Program in a ceremony Friday at the Cralle Student Center on the GC campus. Commissioner Comer and President Greene were joined by Earl Goode, chairperson of the Georgetown College Board of Trustees; U.S. Rep. Andy Barr; state Sen. Damon Thayer; state Reps. Ryan Quarles and Tom McKee; and Georgetown Mayor Everette Varney. Under the Farm to Campus program, the KDA will partner with Georgetown College and food service vendor Sodexo to put more farm-fresh Kentucky Proud products in the university’s food service system. Georgetown’s participation in the Farm to Campus Program will include a unique composting project involving GC, the KDA, and the Scott County Extension Office. They will work together to compost material from the college and make the compost available to area farmers. Georgetown College joins Asbury University, Campbellsville University, Eastern Kentucky University, the University of Louisville, Morehead State University, and the University of Pikeville in the Kentucky Proud Farm to Campus Program.